My Morning Jacket is an American indie rock band established in 1998, Louisville, Kentucky. The band consists of singer-songwriter, guitarist Jim James, bassist Tom Blankenship, drummer Patrick Hallahan, guitarist, pedal steel guitarist, saxophonist, and vocalist Carl Broemel, and keyboardist, percussionist and vocalist, Boe Koester. Whilst primarily an indie band, they incorporate elements of roots, country, rock, and psychedelia. Jim James has an innocent, slightly nasally voice, that catapults out like an anthem over the top of their not too soft, not too loud, instrumental harmonies. In 2005 the band saw their 4th album and second major label release, Z hit the shelves. The album received rave reviews across the board, and earnt them a place on Dave Letterman and Saturday Night Live, whilst receiving credible album sales across the US. 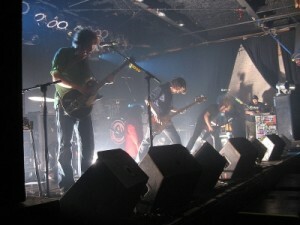 Unfortunately the band went on to release 2008’s follow up Evil Urges to mixed reviews, however they have remained in the spotlight with support shows for Neil Young on his Australian tour, performances on Jimmy Fallon Live, and CNN's 2009 New Year's Eve show performing from Madison Square Garden. They are currently working on a new album scheduled for a release in 2011.